To identify a serial killer, detectives must comb through the video camera footage recovered from the scene of a mass murder. July 27, 2012: Kidwell, Nevada – Police investigate a crime scene involving mass murder and arson at the rundown Lorna truck and trailer repair shop outside of Las Vegas. Footage of the crimes is recovered from damaged video cameras and cell phones found at the scene. Detective Burquez briefs the media on the investigation. Even though he is on leave, Detective Reese pleads to be allowed on the case. Technician Gabe transfers the recovered footage to the server, although he claims that some of it has been corrupted by fire damage. Gabe, the two detectives, and Officer Jenson then begin watching the video footage. Rachel records her actress friend Leann rehearsing. She also records Leann’s live performance. During the curtain call, Leann’s boyfriend Tyler sings a song on his guitar and proposes to Leann in front of the audience. Caught off guard and embarrassed, she turns down the marriage proposal. Rachel has Leann record an apology video, because they still want Tyler to come along on a planned trip to Las Vegas. Tyler later joins Rachel and Leann for the bus ride to Vegas. On the bus, the trio meets Vicki, a dancer from Russia on her way to Sin City. The bus also picks up a 16-year-old boy named Steven. Steven is running away from home to become an apprentice magician. In the background of the video, Burquez spots another woman on the bus, later revealed to be named Katrina. Enhancement shows the woman holding a large Army bag full of cash. The name on the bag reads, “G. Fleishman.” The police begin investigating the name while the footage continues. The passengers notice the bus diverting to a dirt road. Bus driver Ben explains that he has another pickup to make. Katrina begins fighting with Rachel over her constant filming as Ben suddenly hits barbed wire in the road and overturns the bus. The injured group retreats to a nearby repair shop that looks deserted. Vicki unpacks another video camera that was to be a birthday gift for her son so that Ben can use its light to investigate the grounds. Night falls as the group searches the premises. Steven emerges suddenly from the shadows. Covered in blood, he collapses on the ground outside. Meanwhile, the police learn that the Army bag belongs to Katrina’s husband Gerald. Gerald was committed to a mental institution and Katrina recently withdrew all of the money from his bank account. The police speculate that Gerald may be the killer. Video from the camera that Ben had shows a woman wearing a ring being killed by a man with a mask and a welding torch while she reaches for a flare gun. The other footage flashes back to when Ben and Rachel went to the bus and found the flare gun missing. Ben goes outside when he hears a noise. He then disappears after Rachel sees his bloody hands against the window. Rachel and Leann comfort each other back inside one of the shop’s small buildings. Later, the masked welder fires the flare gun at the women. Katrina behaves strangely and then goes off on her own. The remaining three women agree to retrieve the flare gun that the welder left behind. Vicki volunteers to go outside. Leann gives her a ring for luck. Through night vision, Rachel records Vicki’s murder as seen earlier from the other camera. Ben is still alive. He finds his way back to Rachel and Leann with wires to repair the emergency phone. The police then watch a video recorded on Katrina's cell phone. The welder appears and reveals his identity to Katrina before slitting her throat. The welder then leaves a message for the police by writing in blood on the mirror. Meanwhile, the LAPD raids Gerald Fleishman’s hotel room. It turns out that he has been dead for a week from a self-inflicted gunshot wound. His suicide note tells his wife to take his money and go to Vegas. Ben disappears again. Rachel repairs the lights and fights with the welder. Rachel appears to die in a blaze. The recording ends just as the welder is about to lift his mask. Video from Steven’s cell phone shows Leann having an argument with Tyler about the marriage proposal. On the television, the cops see that the video footage has been leaked to the news. A background check on Ben reveals that he has a criminal record. Reese interviews Leann in an interrogation room, as she survived the incident. Reese reveals that his daughter was kidnapped at a mall. Her body was found six months later behind a truck stop in Barstow. Reese learns from Leann that Steven was still alive when he collapsed on the ground covered in his own blood. Reese examines Steven’s body in the morgue and recovers a memory card from inside his mouth. The video recovered from the card reveals Tyler behind the welder’s mask. Burquez announces to the media that Tyler is their suspect. While Burquez is conducting her press conference, Reese notices that the timecode remains consistent even when the video footage is corrupt. He then realizes that the corruptions are actually edits. At the same time, uncut versions of the footage are played by the television news. Leann and Rachel are revealed to have been the real killers all along in a carefully orchestrated plot. Director Olatunde Osunsanmi took an inventive approach to “found footage” with his previous effort, “The Fourth Kind,” by juxtaposing the supposedly authentic video with actor reenactments of the exact same scenes. That style was unique and effective. It is a letdown then, that the recovered camera clips in “Evidence” are instead complimented with the framing sequence of a traditional film. Now the entire movie is able to weigh itself down with clichés from a conventional film as well as those from the “found footage” sub-genre. Stephen Moyer is Reese. Reese is the type of stubble-faced detective on every Homicide department’s roster in the movies. Dedicated and overworked, a recent breakdown has forced Reese to take a leave of absence. But when a serial killer murders a busload of Vegas-bound passengers and sets fire to a remote auto repair shop, Detective Reese is the only one who can make sense of the footage recovered at the crime scene. Suspension be damned. Reese must solve this case and identify the killer. Reese’s job is to pour over the recordings made by a girl named Rachel. Rachel is someone who films everything because she is presumably an aspiring director, even though she cannot hold a palm camera steady or frame a shot to save her life. Rachel is making a mini-documentary about the rise to stardom of her actress friend Leann. With Leann’s recently jilted boyfriend Tyler along for the ride, the two girls board a bus pointed towards Las Vegas. Although only three other passengers are aboard the bus, they are only an Elvis impersonator away from covering the most basic Vegas stereotypes. Steven is running away to become a magician’s apprentice. Vicki is a dancer looking to join Cirque du Soleil. Katrina has a duffel bag full of money, so her next stop may be a slot machine. Yet after driver Ben encounters a barbed wire road and overturns the bus, a rundown auto repair shop literally in the middle of the desert becomes their only refuge. And a masked man with a welding torch is none too pleased about the intrusion. 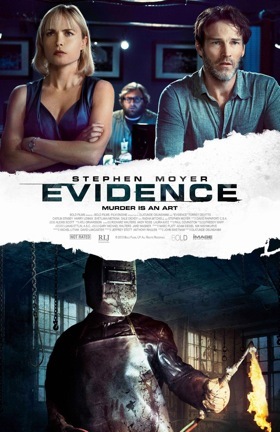 “Evidence” leaps over a few “found footage” hurdles and tries to justify its setup by making it a part of the story. When Detective Burquez asks to fast forward to the money shots, Reese interrupts to basically say, no no, let’s watch the boring stuff first because we need to understand everyone’s background. Much of the video was also corrupted by the subsequent fire, which explains the time jumps and missing scenes in the recordings. The audience is thus watching the footage in the same sequence as the police, as opposed to seeing an edited movie-ready version after the fact. It is impossible to discuss anything more about “Evidence” or its plot holes without introducing spoilers. Suffice it to say, the story is not as clever as it thinks it is and it crumbles instantly when “refrigerator logic” is applied. For the uninitiated, “fridge logic” is Hitchcock’s term for when you are back at home after watching a movie, grabbing something from the refrigerator, and it suddenly dawns on you that the film does not quite make sense. Once all of the pieces are put together at the end of “Evidence,” it is an easy matter to look back at the full picture and realize that not everything adds up. Writing tricks and genre contrivances can buy a film some leniency if they are employed for a worthwhile payoff. But the mystery of “Evidence” is not very suspenseful. The detectives are in a mad race to identify a masked killer, although it is never clear what the stakes are. Details are vague as to how many people survived, how many people died, and how many people were even involved in the first place. Why the police are so sure that the killer is either one of the bus passengers or is associated with one of them in some way is equally fuzzy. Without a reason to care, there is no reason to feel any tension, either. There is even less of a reason to be interested in the framing sequence of detectives reviewing the footage, which is little more than one guy tapping a keyboard and mouse while the others stare at a monitor. Desperate to create a sense of suspense artificially, frantic music swells and the camera continually spins dizzily around the actors as they mutter, “c’mon” at a computer screen. But really, scenes of enhancing pixels in a digital image and listening to a detective shout, “stop, go back” come with a very limited capacity for excitement. “Evidence” is not poorly made, but its delivery is weak. The premise is too wafer thin in the plausibility department and the wraparound segments fail to provide any lasting support. Some may find the final scenes mildly satisfying if they simply accept the film as routine entertainment. Although it is hard to imagine that many will feel “Evidence” presented itself well, even when “refrigerator logic” is overlooked. July 8, 2013 by Ian Sedensky.